A flood plain is any land area susceptible to being inundated by flood water from and source. It includes the floodway, which is the channel of a river or stream and a portion of the overbank flood plain that carries most of the base flood. Flood plains serve many useful purposes, and those that are preserved in their natural or nearly natural state provide a wide range of benefits. For example, flood plains and primary wetland areas hold, filter, convey and disperse floodwaters. Without the preservation of these natural flood plains, floodwaters would inundate developed areas. Is my home in a flood plain? Florence County has approximately 172 square miles located in a flood hazard area as mapped by the Federal Emergency Management Agency (FEMA). 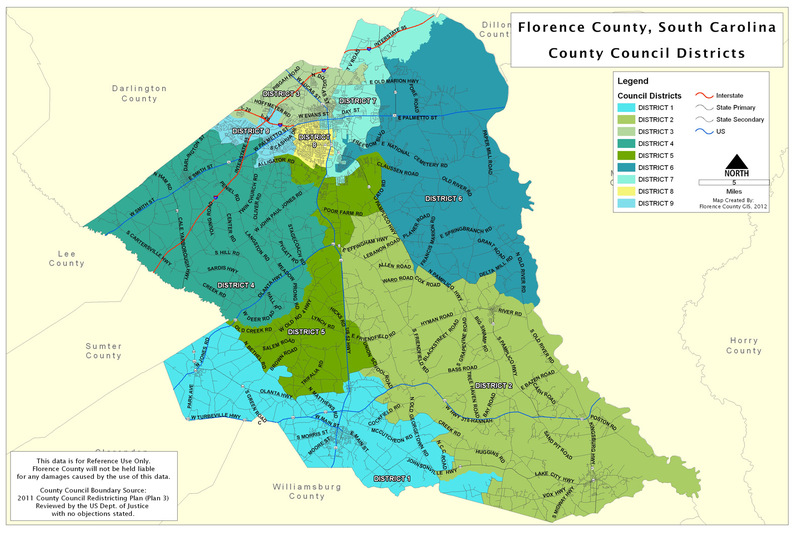 A map of the 100-year and 500-year flood plains of Florence County is available here for your reference. You can also print an official FIRM map from FEMA here by typing in your address. A Certified Floodplain Manager is available in the Florence County Planning and Building Department to assist you with maps, flood protection information, and provide advice on retrofitting techniques for structures in the floodplain. Current and past FEMA Flood Insurance Rate Maps (FIRM), from FEMA can be viewed in the Florence County Planning and Building Department, located in the Florence County Planning Department at 518 South Irby Street. FEMA FIRM maps, reference materials, pamphlets and videos also are available at the Doctors Bruce and Lee Foundation Library located in the City of Florence. What is required when I apply for a building permit in a flood plain? The County’s zoning ordinance identifies portions of the County as being within the 100-year floodplain. In other words, there is a one percent chance of flooding in a given year. The zoning ordinance and building codes have special provisions regulating construction and other development within those flood plains. Without those provisions, flood insurance through the National Flood Insurance Program would not be available to property owners in Florence County. Before you build, fill or otherwise develop in a flood plain, contact the Zoning Department (843-676-8600) toll Free (866-258-9232) to discuss County regulations. All development in the regulatory floodplain requires an Elevation Certificate before, during, and after construction. A copy of the Elevation Certificate form is available from the Zoning Department at 518 South Irby Street or here for (pdf) for (word). Copies of Elevation Certificates that have been submitted in the past are available for review from the Zoning Department during regular business hours. Any development in the floodplain without a permit is illegal; such activity should be reported to the Building Official at the Florence County Planning and Building Department. I’ve had flood damage to my home or business. Who do I call? Inform your insurance provider at the time damage occurs to insure you follow requirement of your insurance policy and take the proper steps to minimize additional damage. A permit issued by the Building Department is required to make any repairs to flood-damaged buildings. Buildings with repair cost amounting to 30 percent or more of the building’s value must be brought into full compliance with the current floodplain regulations. Buildings existing in a flood plain that do not meet the current regulations may only be improved to less than 30 percent of the building’s value. Additions or alterations that are not a result of storm damage also are limited to less than 30 percent of the building’s value. The requirements of the zoning ordinance and building codes are minimum standards that all development must meet. To increase the safety of your property and reduce insurance premiums, you should consider building to higher standards. Of course, the safest way to develop your property is to locate improvements outside of the flood plain. I still have questions about my property and flood plains. Where can I go? Call Florence County Planning and Building Department at 843-676-8600 or toll Free at (866-258-9232) with any further question to talk with a Certified Flood Plain Manager. The Bruce and Lee Foundation Library also has information available to learn about Flood Plains in Florence County Or follow the following links to find out more about Flood Plains.